Cenotes Tours in the Riviera Maya - The Biggest Selection! The Riviera Maya is set on top of a massive underground river system, the largest in the world. Over the millennia, these rivers have carved out huge caverns and tunnels in the limestone shelf that is the floor of the Riviera Maya. In many locations around the area, sinkholes have exposed these caverns, allowing access to them - allowing you the chance to see these magnificent caves. CHECK OUT OUR HUGE SELECTION OF AMAZING CENOTE TOURS! There are many different types of Cenotes - some are filled with water, and are great for swimming, but can only be explored by scuba divers or snorkelers. Others are dry, and can be traversed on foot. Some cenotes are awe-inspiring caverns, with stalactite and stalagmite formations that have to be seen to be believed. Many of these are seen best underwater, giving an appearance of an underwater mountain range. Others are small and unimpressive, usually used as swimming holes or drinking water wells. Of course, the tours above will visit some of the best ones in the Riviera Maya. We offer more cenote tours than anyone, anywhere. 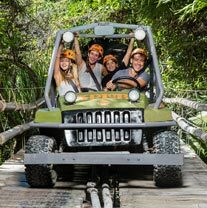 You can explore some of the best caverns around, plus have other adventures like kayaking, sky cycle, snorkeling, or even ATV rides. You can see Mayan Ruins or snorkel on coral reefs - it's up to you what combination of activities you want, or if you'd like to spend the most possible time checking out these impressive creations of nature that have been featured in many movies and documentaries.